Gunnar Birkerts, one of America’s greatest post-war architects, transformed modernism with metaphor and materiality. 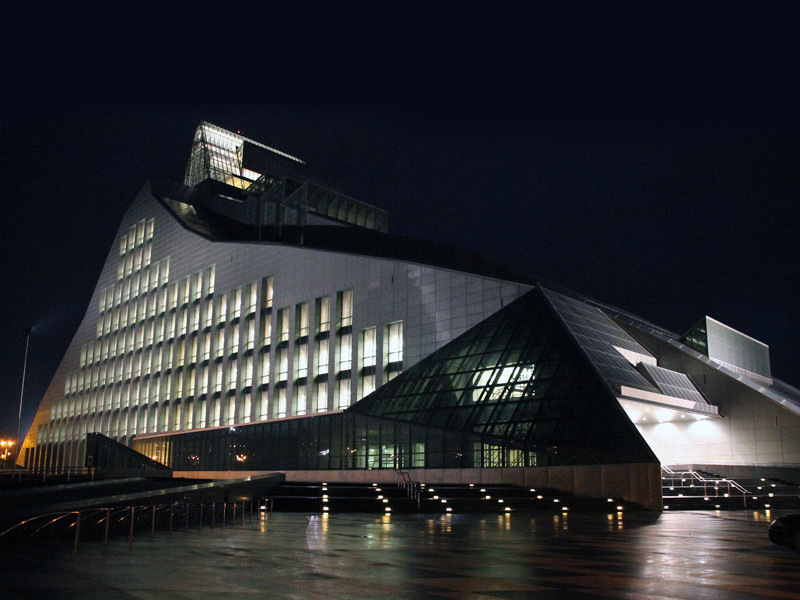 Now aged 89, he has realised an extraordinary glass mountain in the land of his birth - the new National Library of Latvia, a symbol of the country’s independence struggle from the Soviet Union. Gunnar Birkerts, one of America's greatest post-war architects, transformed modernism with metaphor and materiality. 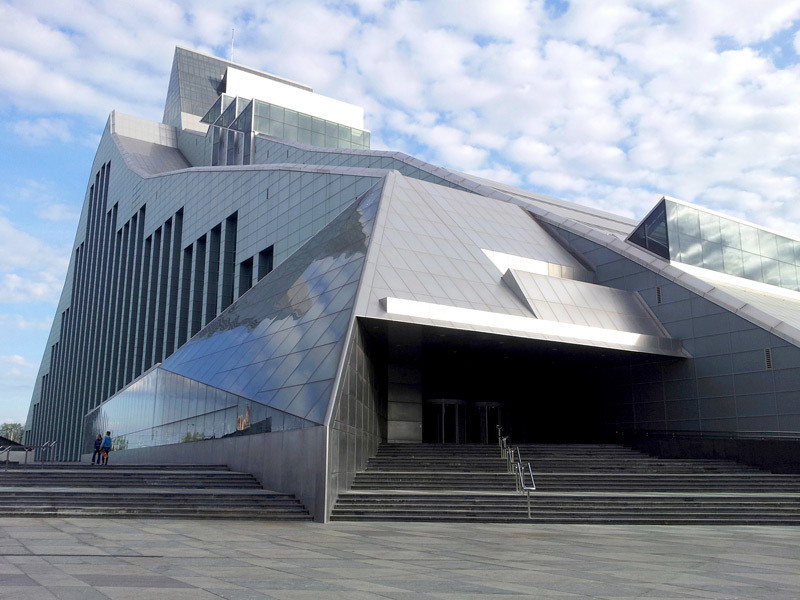 Now aged 89, he has realised an extraordinary glass mountain in the land of his birth - the new National Library of Latvia, a symbol of the country's independence struggle from the Soviet Union. 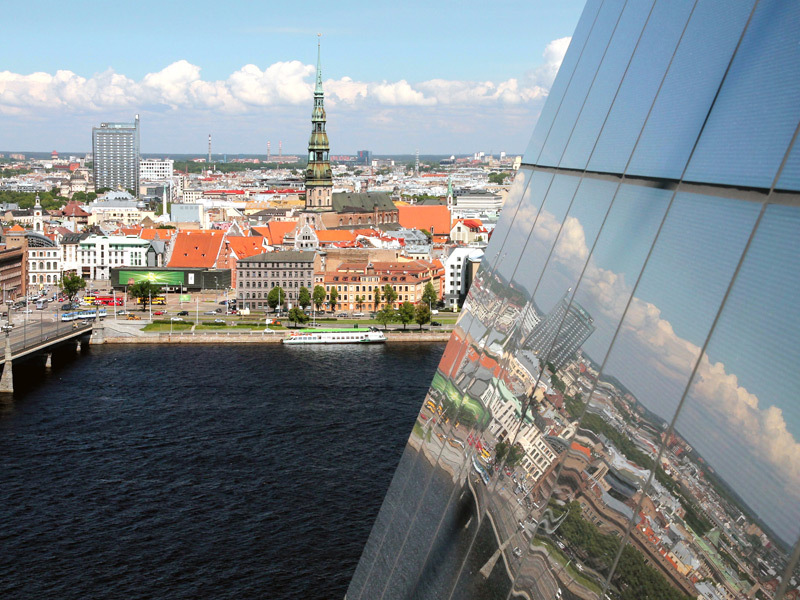 Before it reaches the Baltic Sea, the river Daugava flows north past strange land-based shapes. They stake out a great capital city, Riga. First, on a long mid-river island sliver, is the EU's tallest structure, the 368m-high Riga TV tower, a graceful Eighties' tripod structure on parabolically-curved orange legs, inherited from the USSR. Then, on the east side, a magnificent, massy Stalinist-style skyscraper, the Latvian Academy of Sciences, faces the historic spires of the Hanseatic old town a little way downstream. The tallest is St Peter's Church, its spire elements separated vertically like fuel tanks under a rocket nose, all topped with a golden rooster 123m above the street level. Opposite, shortly before a few emerging capitalist skyscrapers, stands the latest skyline addition, separate and distinct: an extraordinary icy asymmetric triangular slab topped with a jagged crown. 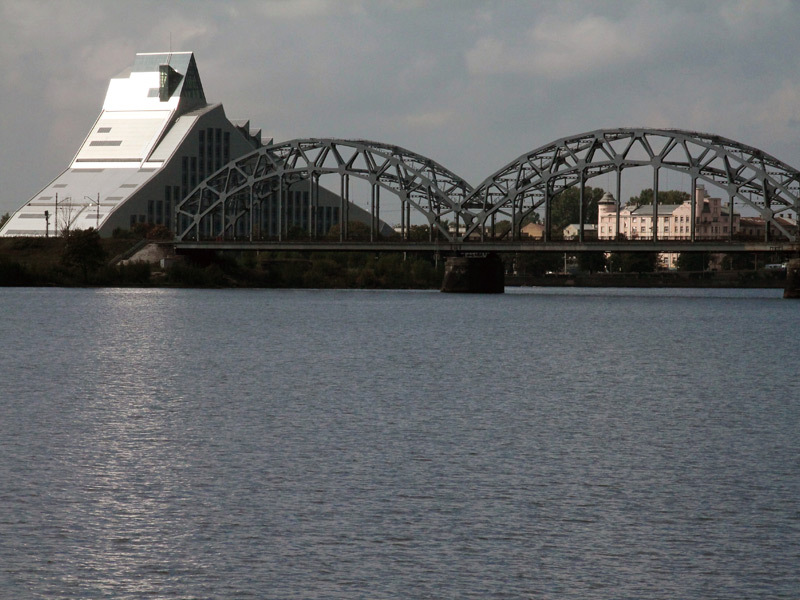 This is the new National Library of Latvia, and the final realised work of one of the USA's great late-modernist architects, Latvian emigré Gunnar Birkerts, now 89. 'It's a very emotional building for me', he told me. Birkerts was born in Riga to parents who studied Latvia's culture and folklore. He made his first architectural drawing in 1942 when he was 17. As the Soviet Union reoccupied the country in 1944 he fled westwards. At Stuttgart's Technische Hochschule he mastered furniture design and architecture and graduated in 1949. Immediately he set off for Detroit, hoping to work with legendary Finnish-born Eero Saarinen, but instead he found work with Perkins and Will in Chicago. Saarinen eventually had a job for Birkerts, thrusting him into a north Detroit nexus of some of post-war modernism's most important figures, including two future Pritzker winners with whom he worked on the seminal General Motors Technical Center at Warren, Michigan -- Robert Venturi (at the very next drawing board, he recalls), and Kevin Roche. Birkerts also worked on Saarinen's extraordinary raised brutalist volumes of the War Memorial Building in Milwaukee. He won the first of numerous awards in 1954. He maintained a continuous output of furniture design, a field in which a jury including Alvar Aalto awarded him a 1956 prize in Italy. He was later with Minoru Yamasaki, working on Saudi Arabia's Dhahran Airport. In 1959, Birkerts set up his own practice in the Detroit conurbation, and became a professor at the University of Michigan. His first commission was 1300 Lafayette East, Detroit (1963), a co-op tower adjunct to the residential Lafayette estate by Mies van der Rohe, of whose regimented facades Birkerts disapproved. Strong, surprising forms were to come, but no hallmark style emerged. Rather, as he tells Blueprint, 'every building is different. I don't have that many buildings that are urban, they end up being lone-standing buildings'. The common thread is a continual originality in composition, engineering and materials. At the iconic Federal Reserve Bank, Minneapolis (now Marquette Plaza), completed in 1973, he hung office floors from catenary cables, their curve iconically marked across the glass facade. Birkerts says that, of his American portfolio, it was 'the most interesting, the most forward building'. An interest in metal technologies dates back to 1958 and an unrealised design for an aluminium house. It continues in key works including the red metal skinned triangular Corning Fire Station in upstate New York (1974), the stainless-steel surfaced Contemporary Arts Museum, Houston (1972) and the almost Gehry-esque Corning Glass Museum extension (1980), of which Birkerts says he is most proud of and 'the first one where I depart from orthogonality'. Although its exterior floating, flowing strips are visually different, this is the project which Birkerts says is the most similar to the new National Library: 'Both have metaphors as concept, so they are expressive, have organic forms supporting my material choices -- stainless steel and special glass.' Later Birkerts incorporated dashes of PoMo, such as the shiny Capitol-like dome on the University of Iowa College of Law (1986), or the playful columns holding up the entrance canopy into the freeform spaces of the Kemper Museum of Contemporary Art, Kansas City (1994). Writing in 1994, Birkerts referred to the 'organic synthesis' of his creative process, in which each parameter is considered 'before conceptual combustion can take place'. Further, he wrote that 'allegiance to history and culture, and not simply the mode of the day, is essential to the lasting quality I strive for in my architecture'. That would be particularly so in Latvia, where the magic cultural ingredient was found in the fable about a sleeping princess atop a mountain of glass, whose smooth surface defeats would-be suitors attempting to scale it to reach her. It's something he recalls that Latvian schoolchildren were taught, and the metaphor here is that the sleeping princess is freedom. 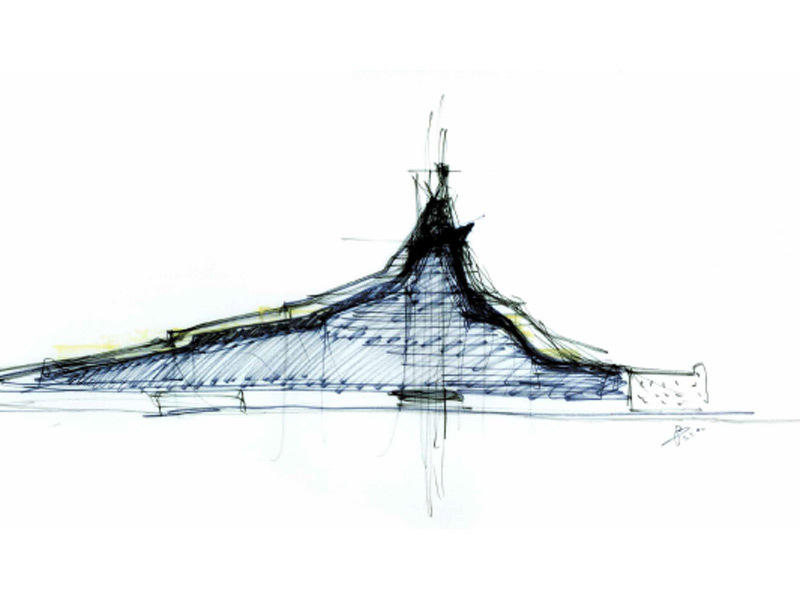 The Glass Mountain defined the National Library's form in sketches from 1989, and Birkerts says 'people embraced the idea'. Then, an alternative metaphor came forward: independence as a sunken castle of light that rises from the dark depths. The poet Mikus Krogzemis (aka Auseklis) described this in 1873 and it was put to music by Jazeps Vitols in 1889. The resulting choral song, Gaismas Pils (Castle of Light), is almost a national anthem, and its performance in 1985 is credited as stirring Latvia's reawakening as a nation. But a castle is not a mountain, so Birkerts adapted his design with 'physical projections', notably the glass skylights on the great slope of the south-facing roof, but it was not the only major change to happen in the 20 years between concept and construction. The original design was longer, spanning the small street at the south of the riverside site, but budget limitations cut back the building's footprint, and ceiling heights were lowered to fit in more floors to compensate for lost area. In the final design, it still offers a huge 40,455 sq m, more than recent landmark libraries in larger European cities, such as Mecanoo's Library of Birmingham (35,000 sq m, 2013) and Yi Architects' Stadtbibliotek Stuttgart (20,225 sq m, 2011). Of course the new library is national, not local. Ginta Zalcmane, head of the library's information service department, says that its two million books, ranging from a 1586 church handbook to telephone directories, are less than half the collection. Periodicals, posters, manuscripts, maps, music in a century of formats and more are in the national collection, currently spread across six locations. The State Library was established in 1919 in a 1909-built bank building in the centre of Riga. There, light falls through exquisite etched-glass windows on to ancient banks of card-index drawers, exposed wiring trails across peeling plaster in rambling back-corridors, tiny old lifts shudder, and in the labyrinthine damp basement, dense storage shelving heaves with books under low ceilings. It's romantic and beautiful, but in 2010 a floor collapsed. Things had to get real. 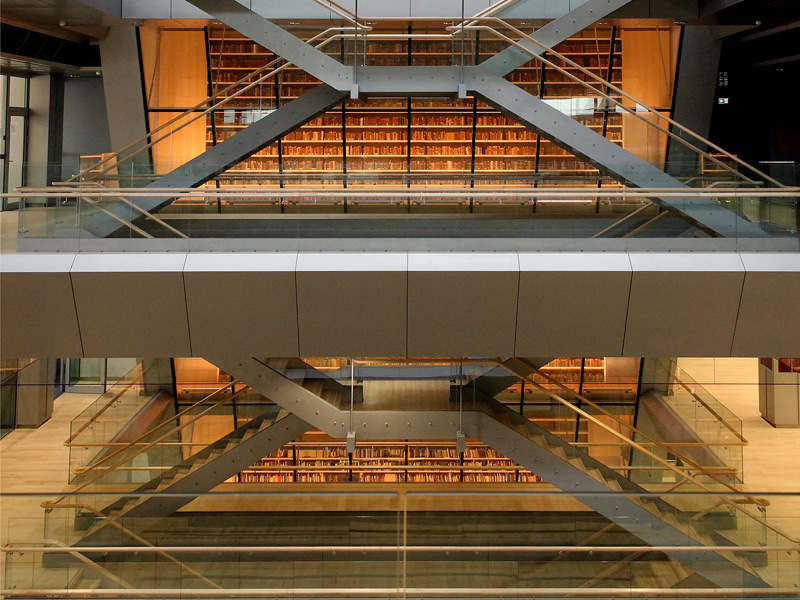 The new library is 170m long and 44m wide, orientated almost north-south along the river, from which it is separated by a garden with paths jagged like tree roots. A supplementary plant building by Birkert's local architecture collaborator Gelzis-Smits-Arhetips (the practice of the late Modris Gelzis), rectilinear in solid grey with blue glass and discrete despite its four storeys, is to the south. The library entrance is at the northern end, stepping forward towards the Stone Bridge that crosses directly to the Old Town. No section of the 15,300 sq m stainless-steel roof is flat. The library is a concrete structure clad with glass, its higher floors in a steel frame, which was topped out at a height of 68m in May 2011. Up there, a steeply pitched glass structure erupts where the long steepening slopes of roof would meet. This two-storey apex glass house, on levels 11 and 12, is where the metaphorical princess would have slept, but it will now host special events. The view is extraordinary, with St Peter's Church exactly aligned across the river. Throughout the building there is wood: Canadian maple flooring and Latvian birch panelling for the walls, which here merely enclose lift and stairs. An enclosed staircase (one of two) descends from level 11, its metal walls coldly bouncing light. All stairs and bannisters are wood, at Birkerts' insistence. From level 10 down, the building is effectively three separate slices laminated together. Offices are situated in the slice behind the west facade, facing inland, their windows forming horizontal slits with steel bris-soleil strips along them. A great internal drama lies in the building's central slice. Below the glasshouse apex, three more stacked glass structures rise vertically, then angle back into the northern roof slope. 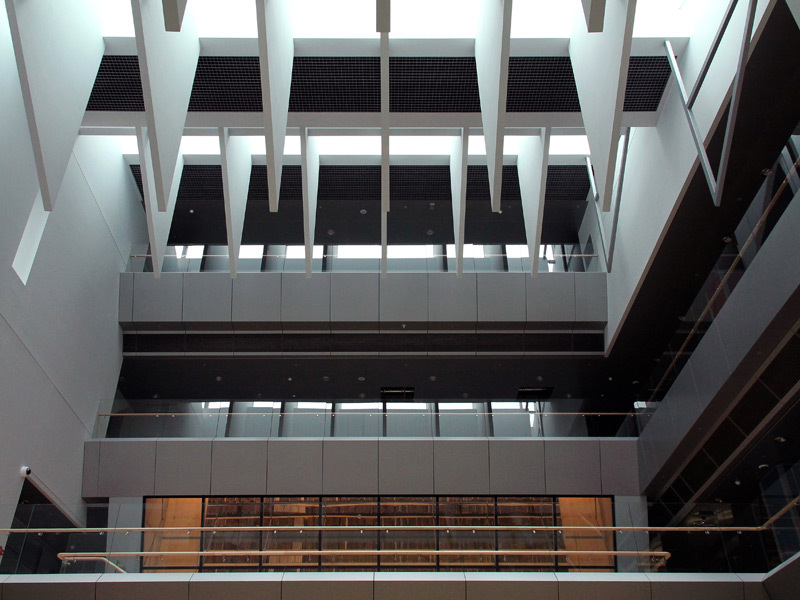 These skylights sit above the library's astonishing central feature: a huge eight-storey atrium. Inside each skylight in the atrium's upper reaches, parallel sets of triangular vertical fins hang, as sharp as shark's teeth, channelling light deep into the interior space expanding below, wider with each floor down. From levels two to eight, the south side of the atrium is bounded by a great continuous vitrine, angled as if a glass skyscraper facade was frozen as it toppled forward. It exposes bookcases on six levels, the ends of book storage areas that continue behind. Reflecting how traditional Latvian farm storage buildings called klets placed more valuable goods higher up, Birkerts has specified the same for more precious volumes. 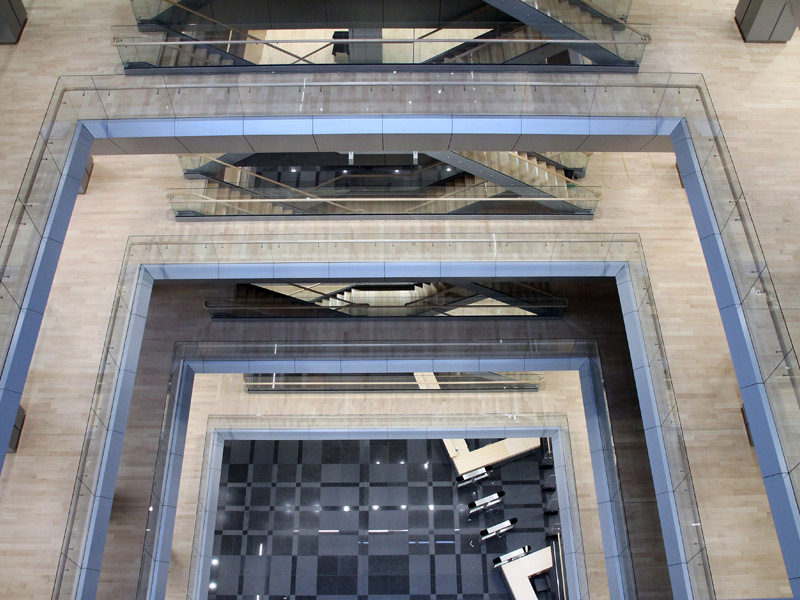 In front of this glass wall, a scissor stack of staircases descend across the atrium, which is spanned on each floor by metal bridges carrying walkways, defining a clear square void from skylights to lobby. Columns around the atrium are marked with vibrant shades of the colours of Latvia's banknotes before it switched from lats to euros, changing on each floor for different denomination. This descent through red, then blue, then yellow, and so on, animates the great atrium's otherwise pristine continuum of metal and wood. There is more colour, but it is subtle -- hues woven into the grey carpets spanning the reading rooms off of the atrium and spreading along the eastern slice of the building. Much of the 1,200 reading places will be here, looking out on the river. The windows are arranged as vertical strips in the eastern facade, like a histogram, referencing the verticality of birch - as Birkerts says: 'The birch forest is as Latvian as they come.' The reading rooms get larger going down, and on level 3 they split to create free open space between them. The biggest continuous upstairs space of 1,500 sq m is on level 2, and will be for social sciences. Escalators descend from here, through a mezzanine level with a big information zone to the ground floor, where the wide lobby has polished granite laid in a traditional Latvia linen-weave pattern. The lobby is bounded by exhibition spaces, a restaurant, cloakrooms and lifts. To the north, the building angles out at the ground from the riverside facade, reaching towards the Stone Bridge with an extension defined by glass triangles to provide the main entrance. At night, it takes on an aspect like IM Pei's Louvre pyramid. 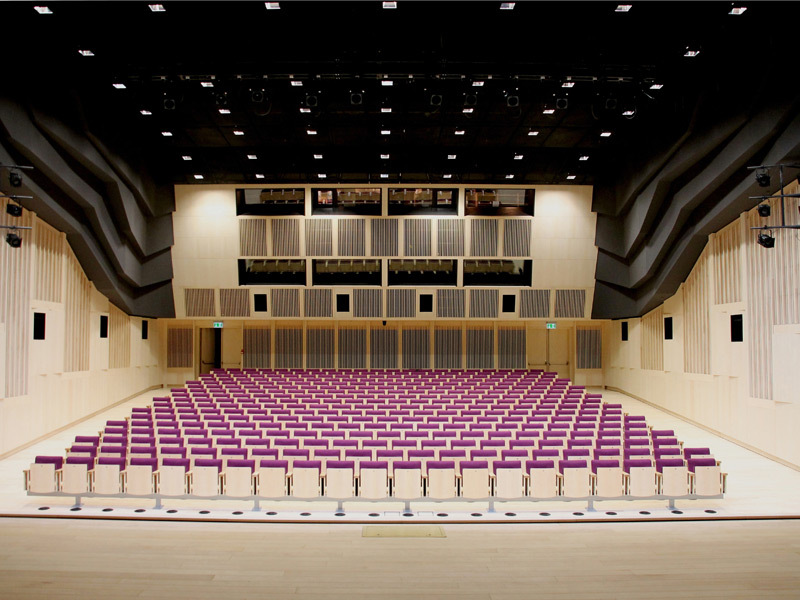 This end also hosts a 400-seat auditorium, with its own triangular skylight erupting from the roof slope. The basement contains service entrances and meeting rooms. From glass apex crown to basement, Birkerts has discretely qualified the expanses of wooden wall panelling with ribbed sections. The wooden furniture he has conceived for use throughout has a simplicity and finish reminiscent of Alvar Aalto's. 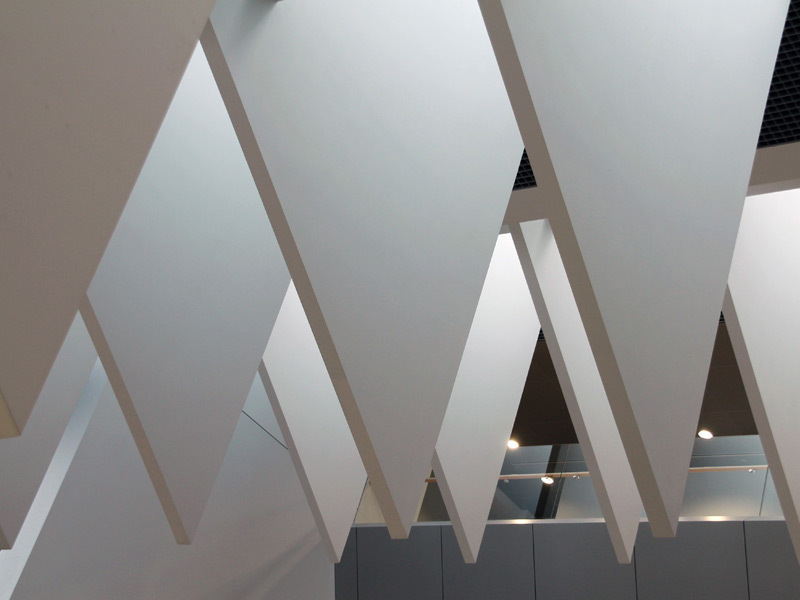 The material interplay between wood and hard glass and metal that Birkerts creates is ubiquitous, and the effect is crisp, yet understated compared to the spatial drama of the atrium and the sharp angles popping up everywhere. The new library opens in August. 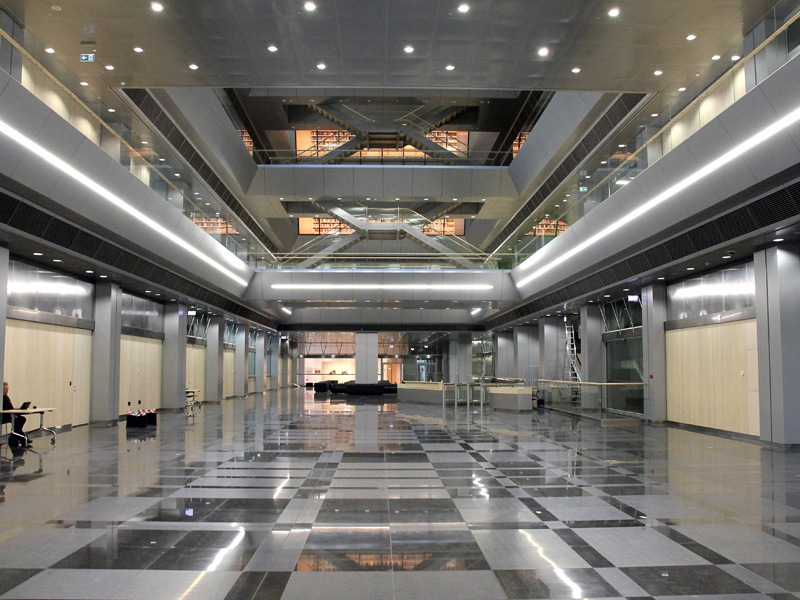 Construction (excluding fit-out) came in at €163m -- extraordinarily, the budget set in 2008 when work began. This January, 14,000 Latvians formed a 2 km human chain to pass books from the old to new libraries. In 2015, it will host the EU presidency and fill with politicians and bureaucrats, but it belongs to the people. Hopefully, that includes the Russian-speaking Latvian minority as well -- at least the fire evacuation notices are in Latvian, English and Russian. Many historical works are in German or Russian, and now English acquisitions proliferate -- 1.8 million items are in languages other than Latvian, according to Zalcmane. They help make the project national, rather than nationalistic. Modern engineering and digital design make spectacular buildings increasingly commonplace, but they're still recognisable as belonging to our time. The National Library, however, is something apart; its peaks and slopes are almost as much landscape as architecture. The reflective surfaces of glass and steel might suggest science fiction, but they also echo the keen air, crystal waters and silvery birch of northern climes. So too its wood and light, the materials that inform its interiors. The atrium's angled heights, like a cathedral's, has a sense of the mystical. Embodying myth, physically anticipating the future, and creating wonder, this extraordinary building is timeless.